It’s been grey skies and non-stop rain here in Dubai this week, which inspired me to make soup. That’s a lie, it actually inspires me to watch Netflix and do sweet FA, but this is a food blog so that’s probably not going to cut it around here. So here is a delish soup that I did make, inspired or not. Feel free to add more chillies if you want it spicier. It also freezes well. Peel and chop the pumpkin and sweet potato into large cubes. Heat oil in large pot over medium heat. Add onion, chilli, ginger and cook for a couple of minutes, softening onion. Add lemongrass, pumpkin and sweet potato, then cover with stock. Bring to the boil, then lower heat to a simmer until veg is cooked through. Remove from heat and take out the pieces of lemongrass. Blend with a stick blender in the pot. Add the sugar, fish sauce and salt and pepper to taste. 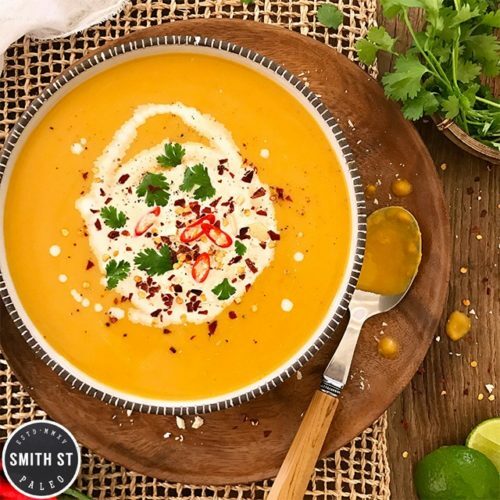 Serve warm garnished with a drizzle of coconut cream and fresh coriander.